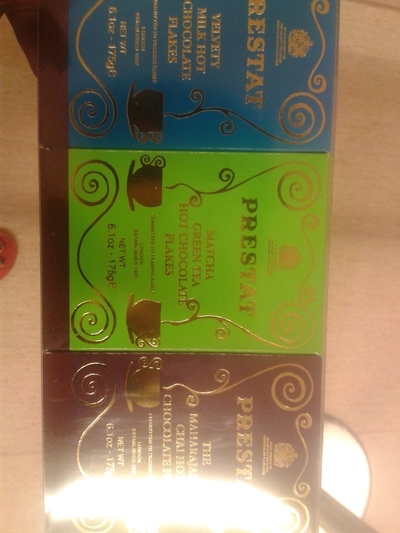 Variety is the spice of life and here is a pack of 3 varieties of the Prestat Hot Chocolate flakes. Choose between the classic Velvety Milk Chocolate, which melts beautifully, all the while perfuming the air with the wonderful aroma of rich creamy chocolate. Perfection. The Maharajah Chai Chocolate is a mix of chai spices, cardamon, cloves and ginger blended with the finest tropical chocolate fuel. Prestat call the third hot chocolate Mount Fuji in a cup, of course they mean their Matcha Green Tea Hot Chocolate. It is in fact, a white chocolate and green matcha tea blend - very smooth and creamy. Chocoholics will love this. I had initially bought this as a treat for myself, but my mother has been in need of a pick me up, and she is a huge chocolate fan. She was delighted when I presented her with this trio of luxury hot chocolate flakes. 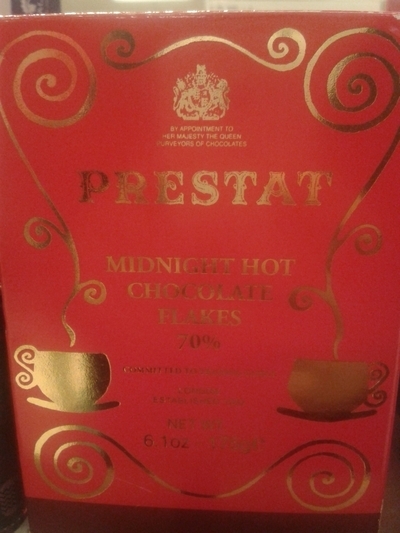 Even if you're not a big fan of Prestat chocolates, you have to give these a try. Hot chocolate flakes, in their interesting flavours are very, very tasty. Whether the Autumnal nights are creeping in, or you're just in need of some comfort food, try these, I can assure you, you'll love them. I've also tried the Midnight 70% cocoa chocolate flakes. It is a darker take on the classic milk chocolate, with deep topnotes, which make for a luxuriously dark and decadent hot chocolate. This indulgent take on hot chocolate suits hot chocolate lovers. Happy warming, mixing, and drinking.